Oh man, there is quite a nip in the air as we inch closer to the holidays. Everywhere you go has glittery, festive decor hanging from every corner. There's a whole lot of hustle and bustle going on as the streets are cluttered with travelers, and holiday shoppers. As much as we love the holiday season, we also love being home away from it all. 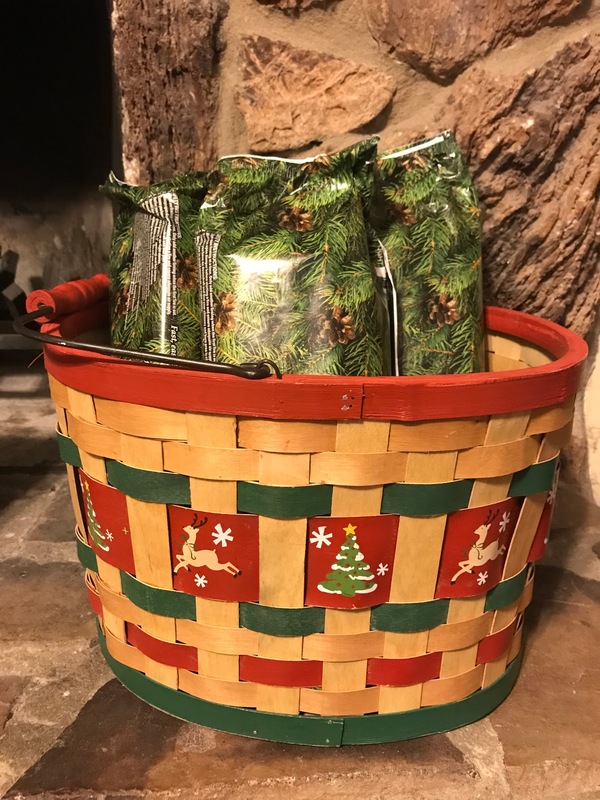 We love making our home feel warm and inviting, especially during this time of year. DIY Network host and Pine Mountain spokesperson Jason Cameron, has put together a go-to checklist for parents. Make a festive snack – Everyone loves making sugar cookies and gingerbread, but the best part is eating your creations! While snacking on cookies, wash it down with some hot chocolate or warm apple cider. Light a fire – A fire is a great way to create a sense of warmth and bonding. 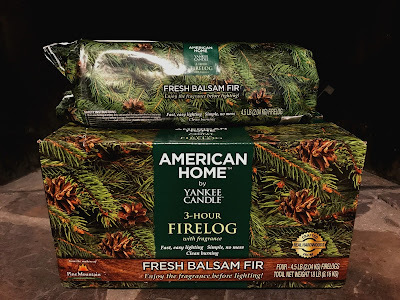 Using a firelog such as the American Home™ by Yankee Candle® Balsam Fir Firelog is a great way to make your home smell of pine and eliminates the need to cut firewood. Watch a holiday movie – From Frosty the Snowman to Elf, we all have a favorite holiday movie. These movies provide a sense of nostalgia for adults, and offer hours of entertainment for kids. Decorate your home – Setting up holiday decorations in your home is a tradition that many families across the country have. Play some light music in the background and chat about your favorite holiday memories to make the activity more festive. Our home is fully decked out for Christmas, and our fireplace is ready for those cold evenings. We keep a stock of regular firewood on hand every year, but also love keeping a few firelogs that are ready to go with no fuss. The American Home™ by Yankee Candle® Balsam Fir Firelogs are our favorite! They smell like a freshly cut Christmas tree before you light them. That alone makes our home have that festive fragrance. They have a 3-hour burn time and easy lighting. 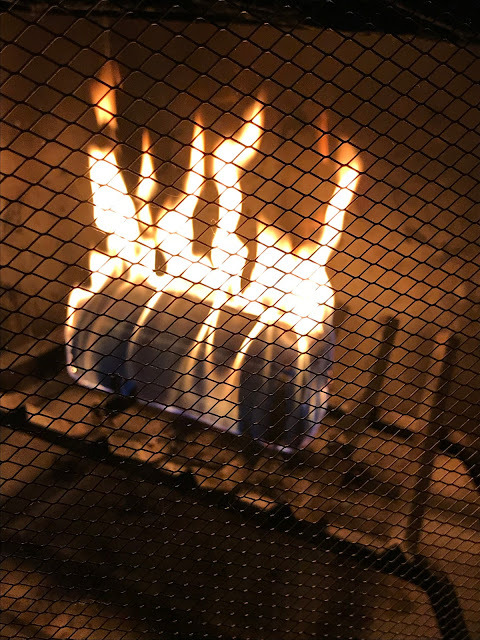 All you do is place the log with the wrapper intact on your fireplace grate. Then you light the tops of the paper where the arrows are printed. Once the paper burns off, the log takes around 10 minutes to fully take off burning. From there, you can enjoy the radiant light and gentle warmth of a lovely fire. It burns cleaner than ordinary cordwood, producing up to 75% less particulate matter and up to 80% less carbon monoxide. It is so pleasing to have a fire that took little effort to start. 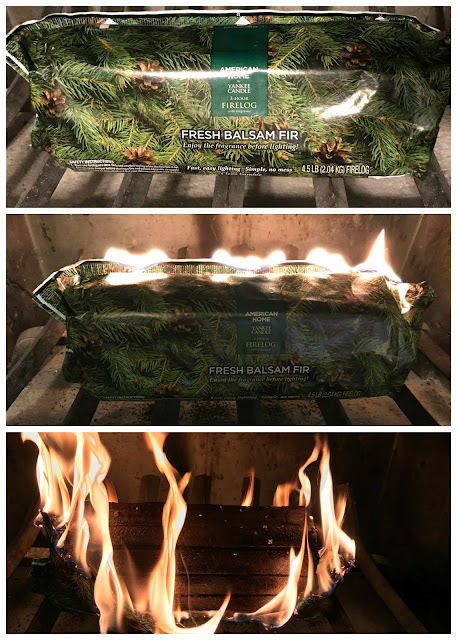 No poking or adjusting logs is necessary with an American Home balsam fir firelog. My husband loves that part since he accuses me of messing with the fire way too much. Ha! 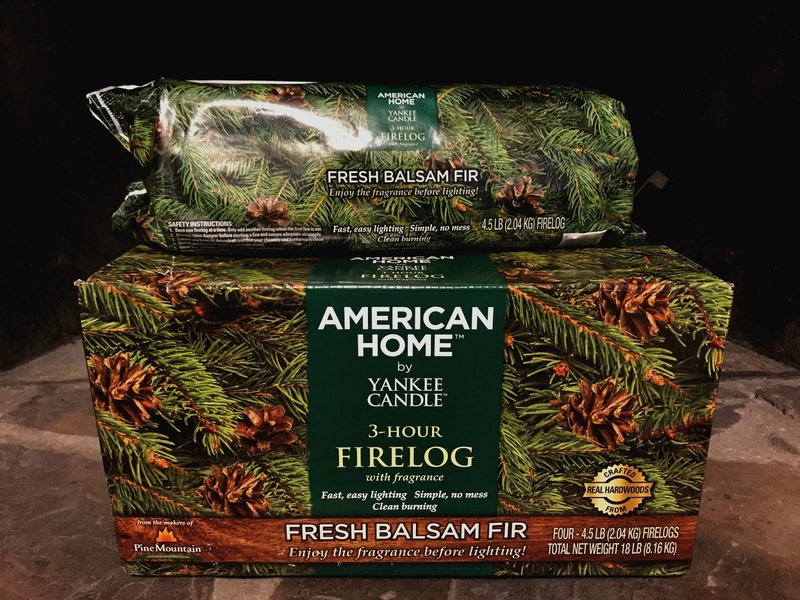 If you have a wood-burning fireplace, you definitely need to pick up a case of American Home by Yankee Candle Balsam Fir Firelogs. They are sold at Home Depot, Walmart, Kroger, Amazon, True Value, Walgreens, and ACE Hardware stores. They are so nice to have available for if you are expecting guests over. It really makes your home feel super cozy.